As a Trolling fishing fan,you can get this Key Chain as a gift for your friends and yourself. 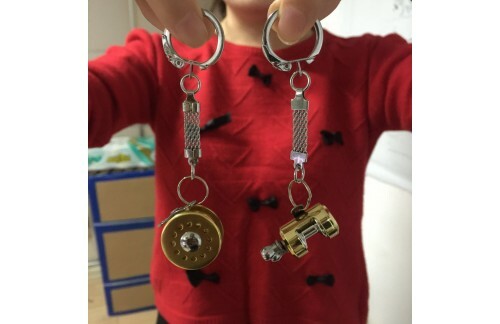 Details are as follows: Trolling reel Key chain Reel Diameter: 0.5 inches Reel Length: 1.2 inches Chain Length: 2.1 inches Weight: 0.5 ounces Color: gold ● Made of aluminum, gold color, the reel has real moving parts. ● A kid can hold it in his hand, ● A tiny reminder of your favorite pass time. ● Great gift idea for any fisherman, fisherwoman or fisherkid ! ● These are tiny yet have real moving parts that mimic the real action of their larger cousins. ● Turn the handle, Fun to play with. ● comes with a keyring so you can keep it with you all day.